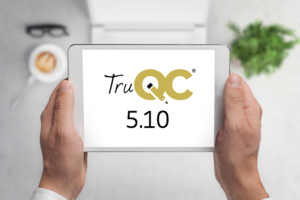 TruQC 5.10 is now available for download in the App Store! This version includes more report building components and a few other fixes and improvements. To Update: Tap the blue App Store icon on your home screen. Search for “TruQC” in the search bar, then tap “Update.” TruQC 5.10 will then begin installing. Once complete, you will be prompted to login once again. TruQC 5.10 is only compatible with iOS 11 or higher. To update your Web App: Depending on your web browser settings, your Web App may update automatically. If it is updated, it should say “Web 2.9, Server 3.9”. If your Web App is not updated, you will need to clear your cache and reload the Web App. Click on the web browser you use for instructions: Google Chrome, Safari, Internet Explorer. If you have any questions, visit our Contact & Support page or give us a call at 1.866.488.4170.